"Verily, verily, I say unto you, if you desire a further witness, cast your mind upon the night that you cried unto me in your heart, that you might know concerning the truth of these things. Did I not speak peace to your mind concerning the matter? What greater witness can you have than from God? Look unto me in every thought; doubt not, fear not." 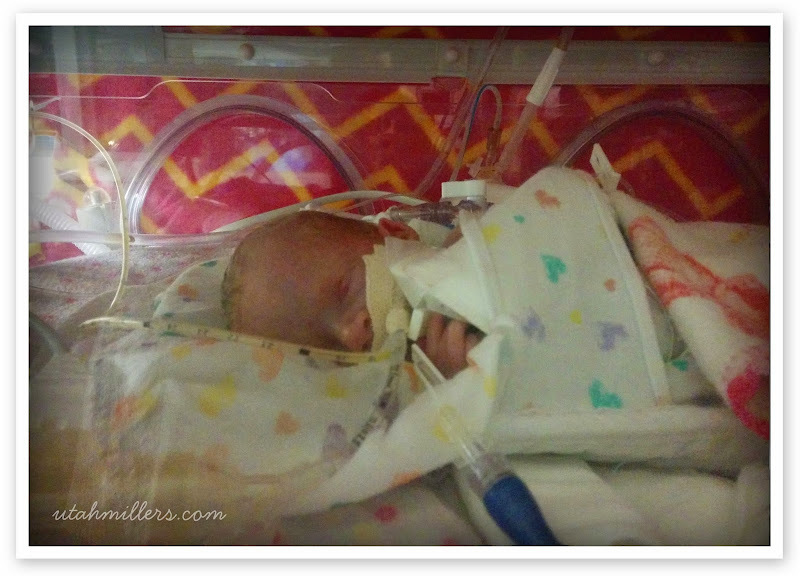 Our sweet Carly Rose Miller (named by her birth mom) was born Saturday, October 25th at 5:50AM and weighed only 2 lbs. 4 oz. The story of how she found her way to us is a very sudden and unexpected one, so let me start at the beginning. We became eligible to adopt again on October 1, 2014. Three weeks later on October 24th we received a phone call from our case worker wondering if we would be willing to be considered by a birth mom who was due the first of January with a baby girl that would be born with Gastroschisis, a congenital defect that causes the baby's intestines to develop on the outside of the body. Obviously the situation didn't sound ideal, but as we thought and prayed about it we felt we should allow ourselves to be considered. I knew of a girl my age that had been born with this same defect who has lived a perfectly healthy life. They repaired the issue at birth and the only thing different about her is that she has a scar in place of a belly button. We didn't feel it was a super major issue and it could be repaired, so we told our case worker we would be willing to be considered. At 8:01AM the next morning our caseworker called to tell us the birth mom wanted to meet us AND that the baby had just been born extremely premature at only 2 lbs. 4 oz. and was barely clinging onto life! The birth mother was only 30 weeks along. To say we were completely shocked is an understatement. We thought we'd have at least until the end of the year to prepare ourselves mentally and physically if this particular birth mom ended up choosing us, but now we were suddenly confronted with a whole lot more than we could have ever anticipated. We were completely flabbergasted and overwhelmed. Our case worker said the birth mom was hoping we could meet her that day and we definitely wanted to meet her as well to help us know whether or not this situation would be right for us. One thing we have learned through adoption is that God has a very clear and special way of letting adoptive parents know when a child is meant to be a part of their eternal family. We felt it when Bryson's birth mom first contacted us and we felt it again when we first met Lilly's birth mom. Through the feelings we felt with each of them, we knew without a doubt that Bryson and Lilly were meant to be a part of our eternal family. With both adoptions, we were also considered by several other birth mothers but those feelings were never fully there. We knew that meeting this sweet baby's birth mom would help us know if she was meant to be our daughter or not. A few hours later we headed to the hospital to meet the birth mom. On the drive there I literally felt like my heart was about to explode from the anxiety I was feeling. I was kind of freaking out but of course Mike was calm and like a rock. Meeting Gina (the birth mom) was a wonderful experience. Gina was so sweet and her mom and dad were so supportive and caring. We immediately felt a connection with them and there was such an immense feeling of love in the room as we visited. Mike and I drove home feeling really at peace about moving forward. Later that day our case worker told us Gina had officially picked us to be her baby (Carly)'s parents. Our case worker knew this whole situation was a lot to take in and told us to think and pray about it and then to get back to her with our decision regarding whether or not we wanted to move forward with the adoption as soon as possible. The following day we learned that the birth father would be visiting the hospital that day with his family (mom, sister & sister-in-law) to see Carly. Gina called and asked us if we would be willing to come so we could meet him and so we could also meet Carly. Unbeknownst to us, the birth father was not yet on board with the adoption and was considering raising Carly with the help of his family. Fortunately we were able to spend some time getting to know them and learned that they had never had any experience with adoption, which was the main reason they were not totally on board with it. We were able to meet with them in a private room and shared with them our adoption experiences and how things work in an open adoption. We completely poured our hearts out to them and by the end of our conversation with them, there wasn't a dry eye in the room. The feeling of love in that room for sweet Carly was unbelievable! It is an experience I will never forget. 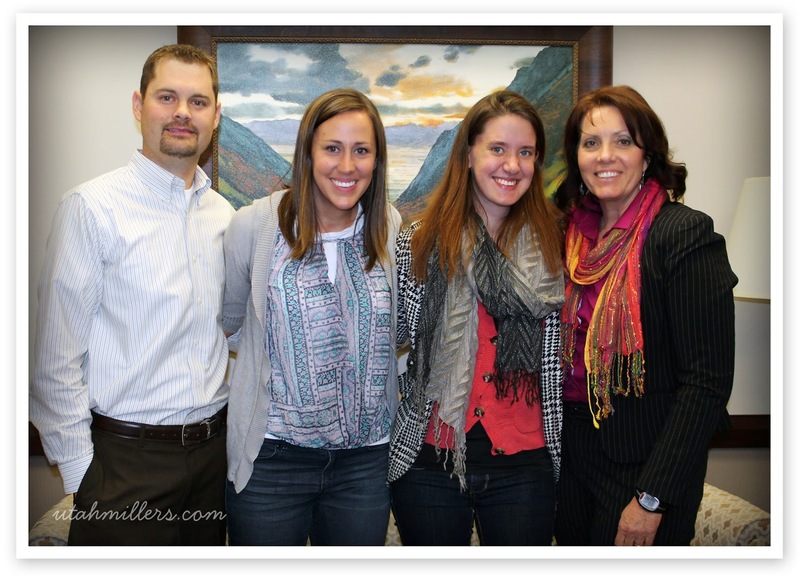 Gina's case worker also played a huge role in educating them about adoption and by the end of their visit, Carly's birth father signed the papers. As soon as Gina heard he had signed, she immediately broke into tears and considered it a miracle. During that visit we were also able to meet Carly for the first time. I expected to see a very small baby, but I could not believe how tiny she really was. Pictures don't do her tininess justice. Even though she was itty bitty, she was absolutely beautiful and so perfect. 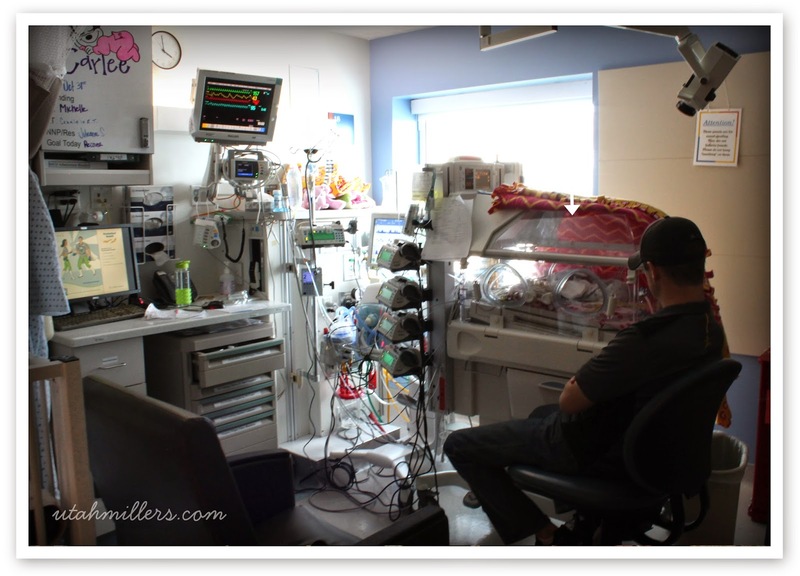 Seeing her hooked up to so many machines and literally fighting for her life really tugged at my heartstrings. I could feel the enormous strength of her spirit. I could feel her spirit pleading with mine to be her mommy even though her journey would not be easy. I could feel how precious she was in God's sight and just felt so honored and blessed to be in her presence. By the time of my visit, the doctors had already been able to get all of her intestines back inside her tummy, but the hole was still open. The pressure of having her intestines back in her tummy was causing a lot of stress on her other organs so she had to be intubated and was (and still is) being monitored very, very closely. 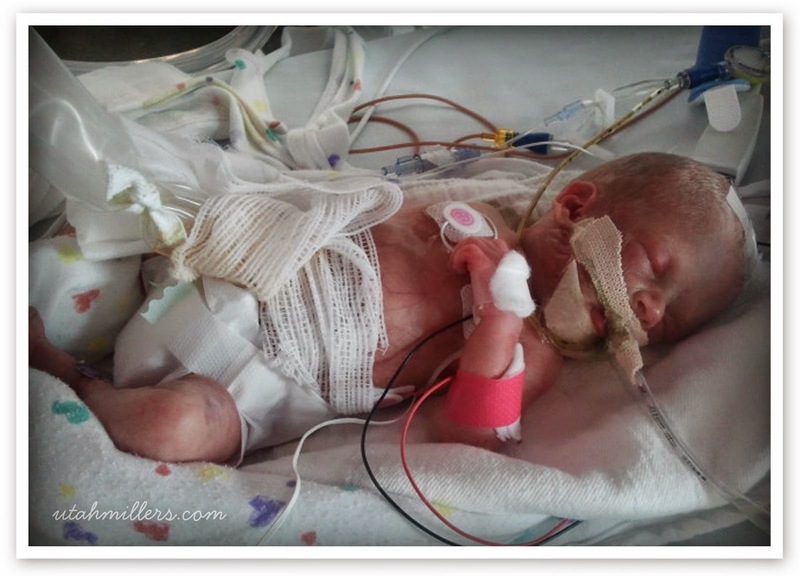 We drove home from the hospital that day completely overwhelmed by the situation before us. All of a sudden we were being asked to adopt a baby with severe medical issues and an unknown prognosis. We didn't know what the future would hold, but we could somehow sense that adopting Carly would result in our world being completely flipped upside down. The thought of that brought a lot of fear and uncertainty to our minds and scared us to the core! That night was one of the greatest inner struggles of my life. I knew this precious child of God needed a family and a mother to love and raise her but I didn't know if I could do it. Quite honestly, I didn't want to do it. When you have a biological child with medical conditions or other less than ideal circumstances, you don't have a choice. That child is yours and you take it. With adoption, you DO have a choice. You can choose to accept a baby or not. You have a choice and that's what can make adoption so hard sometimes! A few years ago we were selected by an amazing birth mom that we ended up turning down because we couldn't get over the feeling that her child was meant for another family--not because there was anything wrong with her or the child, both were perfectly healthy-- but because we just couldn't come to feel at peace about the situation. In that particular situation we chose, due to the feelings we felt as we prayed about it, not to move forward with the adoption and quite honestly, at this point, I was hoping we wouldn't have to move forward with this "less than ideal" situation either. But as with each of our other adoptions, we knew the decision wasn't up to us. It was up to Him. Because we knew we needed the Lord's guidance, we made a mad dash to the temple after getting home from the hospital that evening. During our time there, Heavenly Father made it very clear that Carly was meant to join our family. That was a good enough confirmation for Mike, but I was still really struggling with it. Even though I knew what God was wanting me to do and needed me to do, I still didn't want to do it and dug in my heels pretty darn deep. I sobbed my eyes out all through the night begging him to not make me have to do it. I knew myself and just felt that I didn't have what it was going to take to be this girls mama. As I sobbed and prayed, I felt impressed to pull out my patriarchal blessing. As I read, I came to a paragraph that I had read countless times before, but that had never made any sense to me. The paragraph talks in great detail about how I would be a nurse, a help to the sick, and spend a lot of time in hospitals (I won't share more than that due the sacred nature of patriarchal blessings). I have never had any desire to be a nurse and so I always wondered how that paragraph in my blessing would ever be fulfilled. But in this moment, that paragraph finally became perfectly clear to me. It described this situation and what I was being asked to do to a tee and once again I could feel and knew without question what the Lord was calling me to do. After reading my blessing, I knew that I was meant to be sweet Carly's mother, but I still struggled with the confidence to do it. Somehow I could sense how severe her medical condition was going to turn out to be and how difficult of a thing I was being asked to do---I was, in that moment, being asked to do THE hardest thing I had ever been asked to do up to that point in my life. I was being asked to do something that would require more sacrifice, more time, and more selflessness than I had ever known before. I knew that adopting her would drastically alter my life forever. When morning came, the struggle inside me continued. I went to my office and as I sat at my desk still crying and praying, a vision of the Savior in Gethsemane opened up in my mind. As I envisioned Jesus kneeling in prayer in the Garden, I knew that the feelings I was feeling in that moment were similar (although on a minute scale in comparison) to how Christ felt as He knelt in Gethsemane. He was being asked by the Father to do something He didn't want to do. Something He knew would hurt and be scary. Something that would take great sacrifice. Something that would be the hardest thing He or anyone would ever have to do before. But because He knew the Father needed him to do it and because His love for the Father was perfect, He submitted His will to the Father and in the ultimate expression of love, faith, and devotion replied, "not my will, but thine, be done." In that moment all feelings of resistance retreated from my heart and mind and I knew I had to follow the example of my Savior and submit my will, as He did, to the Father completely, without ever looking back. I had to do for Him. I had to do it for sweet Carly. I had to do it for me. A few minutes later Lilly, who had been outside my office playing, came into the room and after noticing my puffy eyes and tear streaked face, walked up to me with the most concerned look on her face. She had never seen me so emotional before and suddenly became wise beyond her years and seemed to know exactly what I needed in that moment. She didn't say a word but quietly and carefully climbed up on my lap and wrapped her arms around me and held me like I've never been held before. Lilly's arms became Christ's arms in that moment and I literally felt as though I was completely encompassed by His love and power. From the moment I made the decision to unwaveringly follow what God was asking me to do, Christ was there (in the form of Lilly) to buoy me up and comfort me. Her embrace was a confirmation to me that He would be by my side every step of the way and that with His help, I'd have what it would take to be sweet Carly's mommy and have the ability to care for her in the very unique way she would need to be cared for throughout her life. Peace finally engulfed me and I knew, without a doubt, Carly was meant to be my daughter. Within moments of making the decision to move forward with the adoption, our caseworker called and told me that they had decided, due to the very unique circumstances of this adoption, to cut our placement fee in half. This was only one of many blessings and miracles we received upon deciding to move forward with the adoption and again they all served as a confirmation to me that we were making the right choice and that God would provide for us and be with us every step of the way. God is good! That evening was placement. Placement is always a bittersweet experience. The spirit and the feeling of love in the room was so strong. It was a love entirely focused on the welfare of one precious little girl that none of us had even had the chance to hold yet but that we had already fallen in love with. Gina shared with us the feelings she felt when she first saw our profile and how she knew the moment she saw our picture that we were meant to be Carly's parents. She also said that when she saw Mike standing over Carly's isolette for the first time she was overcome with a confirmation that he truly was suppose to be Carly's daddy. It was really special for us to hear her share those experiences with us. Since placement, Carly has had two surgeries and two blood transfusions. During the first surgery the intention was to sew up the opening on her abdomen, but before doing so they wanted to make sure her intestines looked healthy. Unfortunately, upon examination they found that all of her ileum (the final section of the small intestine) was dead and had to be removed. It's called necrotizing enterocolitis. The remaining small intestine was dying but they left it in hopes that antibiotics would help it improve. Two days later they went in to see if the remaining portion had improved any and miraculously it had--however, her ileocecal valve was not able to be saved and had to be removed, which is very concerning. She currently has a jejunostomy and her next surgery is scheduled on the 6th where they hope to be able to close up the hole. Because she lost so much of her small intestine, she will a chronic illness called short bowel syndrome (aka: short gut) and will be on total perenteral nutrition (TPN) for many years to come. She has a very, very long journey ahead of her but she is a little fighter and we truly feel blessed to have been chosen to help her on her earthly journey. We are getting to know Primary Children's Hospital very well. We visit Carly each day and have been beyond impressed with the surgeons, nurses, and social workers there. They truly are miracle workers! They expect Carly to remain in the hospital until January, if not longer. We are so grateful for the prayers, fasting, babysitting and the unbelievable support we have received from so many. Your love and prayers have meant the world and have been felt. Thank you, thank you! We've embarked on a very unexpected journey with an uncertain destination, and truthfully, it scares us out of our minds! This has been the most faith trying experience of our lives. Period. Carly's future is filled with so many unknowns that is has been easy to let fear and doubt creep in. We have had many moments of protest and weakness and have spent many nights in anguish over our new reality. Our world has been completely flipped upside down. We've struggled because we know this journey is going to be hard, but after much prayer, fasting, time in the temple, blessings, and faith, we know that accepting Carly as our daughter is God's will and the path we need to follow. As our very inspired neighbor shared with us last night, "we have been given a very unique opportunity through this experience to prove our discipleship and to turn our lives completely over to Him." Discipleship does not come easy and we have come to understand that more than ever this past week. We have learned how weak we truly are. We absolutely know we cannot do this without the help of our Savior and we know He will be there to buoy us up through this incredible journey. Our journey with Carly is just beginning and we don't know where it is going to take us, but we know God is in control and has our best interest and Carly's best interest in mind. It has taken us some time, but we finally feel at peace with however this all turns out. Our trust is in Him and we know His will will be done. Please continue to keep Carly in your prayers. I will do my best to post updates on here as we get them. "Don't be afraid of change. You may end up losing something good, but you will probably end up gaining something better." "Where doubt is, there faith cannot be also."